Miss N had a right parietal infarct in February 2015. On admission to inpatient rehabilitation she was independent with her bed mobility, she required mod assist x 1 to mobilise 20m with a forearm crutch in her right hand and an ankle foot orthosis on her left ankle (FIM 3). She was unable to ascend or descend stairs. Miss N was wearing a collar and cuff sling on her left arm and had no functional use of her left upper limb. Now, two years later Miss N has made significant progress. She can walk independently indoors and short distances outdoors with no aid and no ankle brace (FIM 7). She can ascend and descend the stairs with a rail independently and reciprocally (FIM 6). She does not use her left upper limb in many functional tasks but can use it as a stabiliser. It gets tighter the more effort Miss N exerts, when walking fast or going up/down stairs. Q1. When looking at the top video (usual walking speed), what percentage of "normal" walking speed do you think she is walking at? Q2. When walking quickly, people normally increase their walking speed by 70%. Looking at videos two and three, how much do you think she increases her walking speed by? Q3. Which of the following best describes Miss N’s pelvis control from the side view in video three? Q4. Looking at Miss N’s left hemiplegic upper limb which angle best represents the change in elbow flexion angle (in degrees) seen from a normal extended position in standing to the maximum elbow flexion during fast walk trial in video two. Q5. What do you call this change in upper limb position during gait? Q6. Looking at Miss N’s left hemiplegic upper limb in which plane of movement do you see the most movement at the shoulder? Instrumented three-dimensional motion analysis (3DMA) is the current gold standard for objective evaluation of movement kinematics. Movement kinematics analysis is the evaluation of how the joints of the body move through space during a particular task, most commonly during gait. This assessment involves the placement of reflective markers on the body that are detected by infrared cameras and processed through software to build a three-dimensional skeleton that replicates a person’s walking function. 1) The X axis refers to the % of the gait cycle from ground contact of the foot through to ground contact of the same foot. This shows the joint angle throughout the entire gait cycle. 2) The Y axis shows the angle of the joint, with a positive change being one direction of movement (eg. dorsiflexion) and a negative change being the opposite direction (eg. plantarflexion). 3) The red vertical line shows the average toe-off time point. Everything to the left of this is right foot ground contact, to the right is right foot swing phase. 4) The solid blue line represents the average joint angle at that stage of the gait cycle, and the blue shaded band around it shows 1 standard deviation either side of the average. The data used in this graph is based on the average joint angle data collected in a cohort of young, healthy adults walking at a comfortable speed. You can hover over this graph to see what the average angle is at each % of the gait cycle, or if you are using a touch screen press and drag the point on the graph you'd like to examine. This "normative" data can be very useful for comparisons with individual patients. The graphs below show normative data for each joint axis (defined as the grey band), along with average traces and average toe off positions (the vertical lines) for Patient 1 for both her affected and unaffected limbs. Foot progression angle refers to the angle of the foot relative to the direction of walking - think of it as quantifying toe-in and toe-out. You can click the different buttons to see the different joint axes. A number of outcome measures can be derived from these data, including discrete values such as peak angles in each direction and the position in the gait cycle when the peak values occur. These are very straightforward to analyse, being simply the highest and lowest values in the trace and the location of these values. For example, knee flexion is defined as flexion being positive and extension being negative - with 0 degrees being fully extended. In the graph the highest value for the affected leg is 69 degrees and the lowest value is 7 degrees. This means that the peak knee flexion angle is 69 degrees, and the most extended it is would technically be 7 degrees of flexion or -7 degrees of extension (i.e. it never goes into extension beyond the 0 point). The peak flexion occurs at approximately 66% of the gait cycle, during swing phase as you'd expect, and the peak extension occurs at 32% of the gait cycle during midstance. 1) The blue line represent the normative value for elbow flexion during FAST pace walking. 2) The orange line is the result for the patient when we asked her to walk as fast as possible. 3) The shading between these two lines is the difference at each percentage of the gait cycle, which is summarised as a value in the green columns. If you click on a name in the legend on the right you can remove that data set from the graph, then click it again to bring it back on. This might help for visualisation. The following column graph shows the RMS value for each of these joints and axes for Patient 1 when she was doing fast pace walking. The Gait Profile Score for Patient 1 was 8.86 and 9.35 for the affected and unaffected side respectively. This indicates that there was not a lot of overall difference between lower body limbs. In contrast, the Arm Profile Score was 23.39 and 13.07 for the affected and unaffected sides respectively. This is a very large difference. The following questions relate to the kinematic graphs collected for Patient 1. Examine the different angular graphs to find out the results. You may want to open up an additional browser and swap between them. Q1. What was the peak elbow flexion angle for the affected limb during the ground contact phase? Q2. For the affected side elbow flexion at what % of the gait cycle did the largest difference in comparison with normal data occur? Q3. Which joint of the lower limb demonstrated the greatest kinematic abnormality at toe-off? Q4. In the ankle flexion graph, what is the total range of movement of the affected limb joint? Q5. Which joint and axis contributed the most to the high Arm Profile Score on the affected side? What low cost technology is available to assess gait? 1. Inertial monitoring units (IMUs): These systems can consist of accelerometers, gyroscopes, magnetometers and altimeters to give 10 degrees of freedom. The accelerometer provides linear acceleration (in 3 axes), the gyroscopes angular velocity (in 3 axes), the magnetometer direction relative to North (in 3 axes) and the altimeter height above the ground (in 1 axis). Added together this gives the 10 degrees of freedom. When combined together they can create a powerful tool for 3D motion assessment, however to use them for multiple joints becomes very unwieldy and technically demanding. 2. Simple single and multiple camera based systems: This can be as simple as one camera placed directly in front of the person to obtain frontal plane angles through to multiple cameras on the sides, front and behind to track movement. This can become difficult to analyse if manual tracking of movement is required, and to obtain true 3D angles is difficult unless a large number of cameras are used. A 2 camera system with 3D calibration can be performed to obtain joint angles during tasks such as the single leg squat, however the complexity of the software and calibration make this no simple task. 3. Marker-less systems such as the Microsoft Kinect: The Kinect is a low-cost, 3D depth-sensing camera, originally developed for the Xbox video gaming system. The Kinect is an enticing option for assessment because of its ease of use, with no markers required on the person and a freely available software development kit to work with. The Kinect provides benefits over marker-based 3DMA systems due to its greater clinical feasibility in terms of reduced set-up burden, low cost (< $200), significantly shorter patient testing time and simplified processing. Whilst not without its' flaws, the Kinect can provide some accurate outcome measures. This novel method has previously been investigated for biomechanical evaluation with promising results. It has found the Kinect to yield accurate results for some gait spatiotemporal features such as step and stride length and time and gait velocity. We are currently researching the use of the Kinect to provide a simple, low cost but objective method of assessing upper and lower limb kinematics during gait. Previous work in healthy people has demonstrated the Kinect to have poor to moderate validity when compared to 3DMA for assessing joint angles. However in people with quite large impairments this level of accuracy for some joints may be sufficient. Our current testing in people with acquired brain injury shows encouraging results in regards to its concurrent validity to the criterion-reference 3DMA for kinematic analysis. For the lower limb in gait, the Kinect had moderate correlations to the Optitrack 3DMA and a strong relationship for the upper limb. The main limitation with the Kinect is that it cannot accurately assess many axes of movement including ankle dorsiflexion, forearm pronation and wrist flexion because it doesn't have a good reference point. For example, to obtain forearm pronation it relies on detection of the thumb which it cannot do well. It is unable to detect measurements in the ankle joint, forearm and wrist joints well. However, for other joint angles it can be used to obtain a gross measure, and this may be sensitive to change over time in people with impairments. This may have greater implications for sensitive measurement of gait progress, more so than for the upper limb, given that ankle power generation is the major contributor to forward propulsion in gait. The primary joints of interest for associated reactions of the upper limb during gait include the shoulder and the elbow which excluding shoulder rotation, had a strong relationship to 3DMA. Whereas the forearm and wrist are unlikely to be a major contributor to a functionally relevant AR during gait given the small degrees of movement in both healthy and patient cohorts in this group. Whilst the actual joint angles for impaired axes such as elbow flexion may not be accurate to within a couple of degrees, it may be "good enough" to detect changes in impairments over time. Reliability testing for the Kinect has provided strong to very strong results in terms of its consistency over a one week period in a group of chronic patients who are unlikely to change in their physical presentation over this time period. This provides promising results and is an essential psychometric feature. The Kinect may therefore be a valuable tool for clinicians. Given that clinicians have limited accessibility to the criterion-reference 3DMA, the Kinect may be a useful clinical measure in that it can simply, quickly and cheaply deliver meaningful outcome measures and kinematic information in the clinical setting to assist objective assessment of people with ABI and evaluation of treatment efficacy in the clinical setting. The data that it can provide is superior to current practice which involves subjective observational gait analysis and non-specific temporal measures. Future directions: To further investigate the use of the Microsoft Kinect in clinical practice, we are currently performing additional work to determine whether clinicians can confidently utilise the Kinect to measure outcomes in brain injury cohorts and for which outcome measures. What further research is currently underway? With the larger cohort, further work will explore whether the Kinect shoulder flexion and hip flexion maximum and minimum ranges can obtain improved validity to 3DMA with calculation of a joint centre offset values. This is to account for the difference between the location of markers on the surface for the Kinect compared to the virtual joint centre calculation for the ball and socket joint for the 3DMA. Responsiveness testing is underway looking at a group of people with subacute brain to establish whether the Kinect is sensitive enough to detect change over a three-month period time in this cohort. Formal feasibility testing for the use of the Kinect in the clinically setting will also be performed using the rating system by Tyson and Connell (2009. Thanks for looking at our site! Please click here to provide us with feedback, it will be very helpful! Michelle "Mish" Kahn is a physiotherapist specialising in neurological rehabilitation at the Epworth Hospital in Melbourne, Australia. 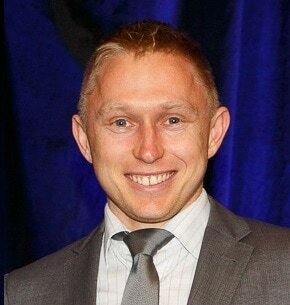 Ben Mentiplay is a soon-to-be post doctoral research fellow currently working at the University of the Sunshine Coast. He helps with the technical aspects of the data visualisation. Baker, R., McGinley, J. L., Schwartz, M. H., Beynon, S., Rozumalski, A., Graham, H. K., & Tirosh, O. (2009). The gait profile score and movement analysis profile. Gait & posture, 30(3), 265-269. Clark RA, Bower KJ, Mentiplay BF, Paterson K, Pua Y-H. Concurrent validity of the Microsoft Kinect for assessment of spatiotemporal gait variables. Journal of biomechanics 2013;46(15):2722-2725. Clark RA, Pua Y-H, Fortin K, Ritchie C, Webster KE, Denehy L, Bryant AL. Validity of the Microsoft Kinect for assessment of postural control. Gait & Posture 2012;36(3):372-377. Clark RA, Vernon S, Mentiplay BF, Miller KJ, McGinley JL, Pua YH, Paterson K, Bower KJ. Instrumenting gait assessment using the Kinect in people living with stroke: reliability and association with balance tests. Journal of NeuroEngineering and Rehabilitation 2015;12(1):15. Mentiplay BF, Clark RA, Mullins A, Bryant AL, Bartold S, Paterson K. Reliability and validity of the Microsoft Kinect for evaluating static foot posture. Journal of foot and ankle research 2013;6(1):14. Riad, J., Coleman, S., Lundh, D., & Broström, E. (2011). Arm posture score and arm movement during walking: a comprehensive assessment in spastic hemiplegic cerebral palsy. Gait & Posture, 33(1), 48-53. Sauro J. Measuring usability with the system usability scale (SUS). 2011. Simon SR. Quantification of human motion: gait analysis-benefits and limitations to its application to clinical problems. J Biomech 2004;37(12):1869-80. Vernon S, Paterson K, Bower K, McGinley J, Miller K, Pua Y-H, Clark RA. Quantifying individual components of the timed up and go using the kinect in people living with stroke. Neurorehabilitation and neural repair 2015;29(1):48-53. Baker, R., & Hart, H. M. (2013). Measuring walking: a handbook of clinical gait analysis (Vol. 1). London: Mac Keith Press. Baker, R., McGinley, J. L., Schwartz, M., Thomason, P., Rodda, J., & Graham, H. K. (2012). The minimal clinically important difference for the Gait Profile Score. Gait & posture, 35(4), 612-615. Beynon, S., McGinley, J. L., Dobson, F., & Baker, R. (2010). Correlations of the gait profile score and the movement analysis profile relative to clinical judgments. Gait & posture, 32(1), 129-132. Carmo, A. A., Kleiner, A. F. R., Costa, P. H., & Barros, R. M. L. (2012). Three-dimensional kinematic analysis of upper and lower limb motion during gait of post-stroke patients. Brazilian Journal of Medical and Biological Research, 45(6), 537-545. Chen, G., Patten, C., Kothari, D. H., & Zajac, F. E. (2005). Gait differences between individuals with post-stroke hemiparesis and non-disabled controls at matched speeds. Gait & posture, 22(1), 51-56. Frykberg, G. E., Johansson, G. M., Schelin, L., & Häger, C. K. (2014). The Arm Posture Score for assessing arm swing during gait: An evaluation of adding rotational components and the effect of different gait speeds. Gait & posture, 40(1), 64-69. Goldie, P. A., Matyas, T. A., & Evans, O. M. (2001). Gait after stroke: initial deficit and changes in temporal patterns for each gait phase. Archives of physical medicine and rehabilitation, 82(8), 1057-1065. Johansson, G. M., Frykberg, G. E., Selling, J., Grip, H., Broström, E. W., & Häger, C. (2013). The arm posture score with additional rotational components (APS6) applied to persons with stroke to assess arm movements during gait. Gait & Posture, 38, S83. Johansson, G. M., Frykberg, G. E., Grip, H., Broström, E. W., & Häger, C. K. (2014). Assessment of arm movements during gait in stroke–The Arm Posture Score. Gait & posture, 40(4), 549-555. Jonkers, I., Delp, S., & Patten, C. (2009). Capacity to increase walking speed is limited by impaired hip and ankle power generation in lower functioning persons post-stroke. Gait & posture, 29(1), 129-137. McGinley, J. L., Baker, R., Wolfe, R., & Morris, M. E. (2009). The reliability of three-dimensional kinematic gait measurements: a systematic review. Gait & posture, 29(3), 360-369. Olney, S. J., & Richards, C. (1996). Hemiparetic gait following stroke. Part I: Characteristics. Gait & posture, 4(2), 136-148. Perry, J., & Davids, J. R. (1992). Gait analysis: normal and pathological function. Journal of Pediatric Orthopaedics, 12(6), 815. Riad, J., Broström, E., & Langius-Eklöf, A. (2013). Do movement deviations influence self-esteem and sense of coherence in mild unilateral cerebral palsy?. Journal of Pediatric Orthopaedics, 33(3), 298-302. Williams, G., Morris, M. E., Schache, A., & McCrory, P. (2009). Observational gait analysis in traumatic brain injury: Accuracy of clinical judgment. Gait & posture, 29(3), 454-459. Williams, G., Galna, B., Morris, M. E., & Olver, J. (2010). Spatiotemporal deficits and kinematic classification of gait following a traumatic brain injury: a systematic review. The Journal of head trauma rehabilitation, 25(5), 366-374. Williams, G., Morris, M. E., Schache, A., & McCrory, P. R. (2009). Incidence of gait abnormalities after traumatic brain injury. Archives of physical medicine and rehabilitation, 90(4), 587-593. Williams, G. P., & Morris, M. E. (2011). Tests of static balance do not predict mobility performance following traumatic brain injury. Physiotherapy Canada, 63(1), 58-64. Williams, G. P., Schache, A. G., & Morris, M. E. (2013). Mobility after traumatic brain injury: relationships with ankle joint power generation and motor skill level. The Journal of head trauma rehabilitation, 28(5), 371-378. Williams, G., Morris, M. E., Schache, A., & McCrory, P. R. (2010). People preferentially increase hip joint power generation to walk faster following traumatic brain injury. Neurorehabilitation and neural repair, 24(6), 550-558.